After 20 seasons on air, the Comedy Central favorite South Park has accumulated an enormous collection of characters. In addition to the main characters, there have been numerous background characters to fill out the cast over the years. Now, you can get a poster that neatly lays out over 130 characters from the iconic animated comedy. 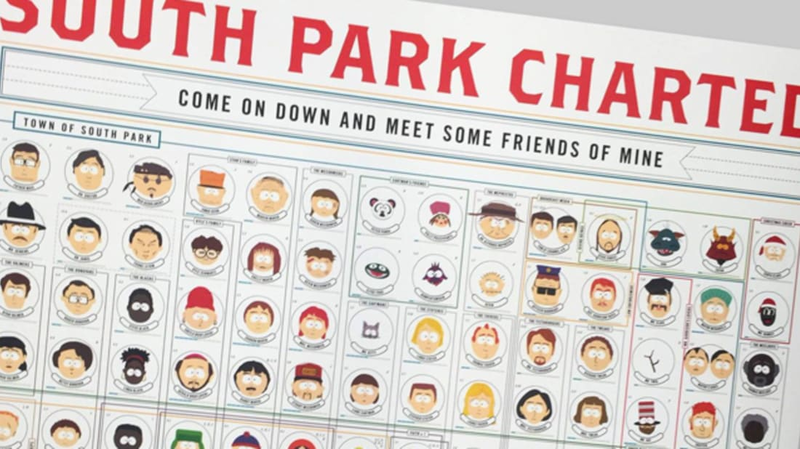 Comedy Central and South Park Studios commissioned Pop Chart Labs to organize their show into a comprehensive chart for fans to enjoy. All the characters are grouped by family, origin, or other defining features (Santa and Mr. Hankey have their own category called "Christmas Cheer"). Next to each face is information pertaining to what episode they debuted in and how often they have appeared since. There are also other appendices, like Randy Marsh's arrest record, how much money the Loch Ness Monster tried to take from Thomas and Nelle McElroy, and all the ways Kenny has died. South Park fans can snag this 24 by 36-inch poster for $35, or for a little more if they want it framed.